Fill a pot with potatoes & squash and add enough water to cover vegetables. Bring to a boil and cook until tender and can be mashed. In a large skillet over medium heat add about 1 tablespoon olive oil and onions. Cook for about 8 minutes untill soft. Remove veggies & add ground beef. Cook until beef is browned. Flavor to taste with salt and pepper. Return cooked veggies along with spinach, corn, peas, bay leaves & any other herb you'd like to add for flavor. Mash the potatoes and squash. Flavor to your liking. I added a bit of the beef stock, a little butter, sour cream, cream and salt & pepper to taste. Rachel Ray even adds an egg which is totally optional. Spoon the mash mixture over meat. Wow, that looks really tasty. 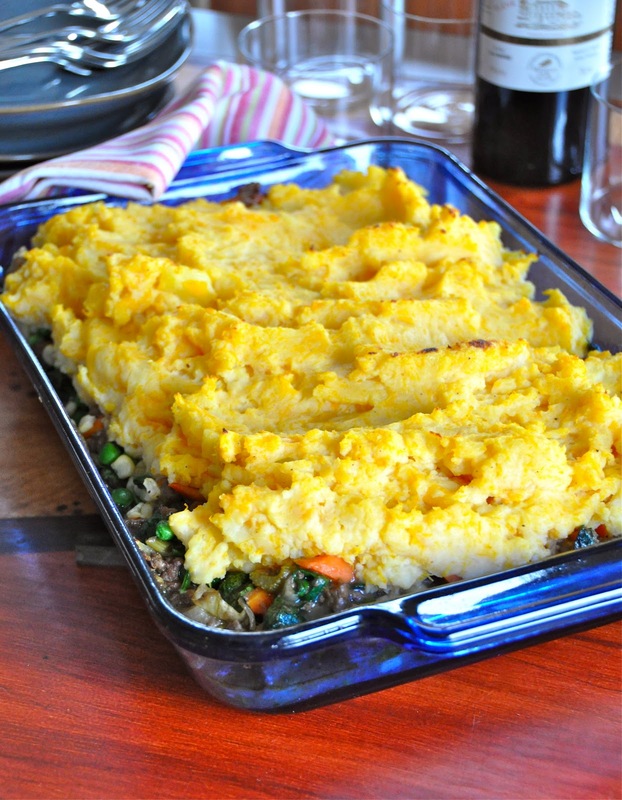 It doesn't look like what I visualize when I think of Shepard's Pie. Looks much better! On a unrelated note, join our new CT bloggers Facebook group, we would love to have you. Wow this looks awesome! I love shepard's pie. It's so comforting. Love your photos too! Beautiful... Your pictures turn out so nice :D thanks for the info about Macy's too I didn't know about that. I'd love to know more. How long should this be baked for? I am planning on bringing this to a potluck.. So if I need to reheat it at the potluck, should I omit the baking until I get there? :) I am new at this cooking thing! Thank you!! Can't wait to make it!! !